Limited edition, only 2000 copies. Only 2000 copies of this 286 page book will be published worldwide making the Panther Book a “must have” for lovers of history. Authors Roddy Macdougall and Martin Block, with the assistance of Panzer Tracks team bring the most comprehensive study of the formidable Panther tank to date. More than ten years of preparation have gone into this book; There are interviews with some of the personnel involved in the development and manufacture of the Panther tank. 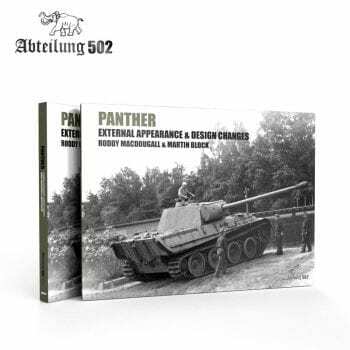 This is the first book about the Panther tank that includes detailed explanations for each of the assembly plants including specifications, Zimmerit application methods and full colour illustrations of the camouflage painting patterns along with detailed perspective drawings of the specific features. There are numerous of photographs with a significant number of them published for the first time! This isn’t simply just another book, this is the standard by which all books about the Panther tank will be compared, don’t miss out – once they’re gone, they’re gone!